A new brand in unique and user friendly cable reels and extension cords is entering the market. 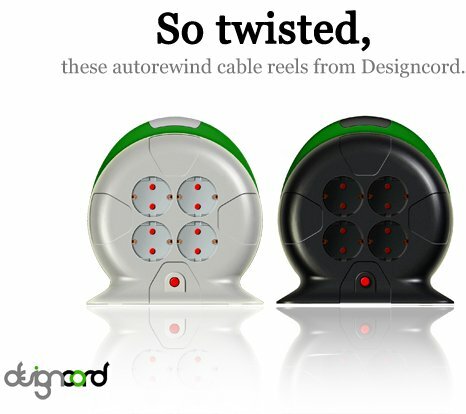 The new Dutch company Designcord is launching their first products in their line-up: AUTOREWIND CABLE REELS of 5 and 10 meters. These reels have a unique and convenient auto rewind roll-up function: just press the button by hand or by foot and the cord automatically retracts. Furthermore these cable reels have fixed sockets. This means that while you wind or unwind the cord, the sockets/plugs and the devices plugged into it remain in place. So no more tangled-up cords. “All is combined in a design with today’s consumer in mind.” says Michael van der Jagt, designer at Designcord. “The Autorewind function make the product so much more convenient. It gives you the same ease of use as the cord of a vacuum cleaner.” Less than a minute is needed to explain the product features by checking out the demonstration video’s at the Designcord website at www.designcord.com.